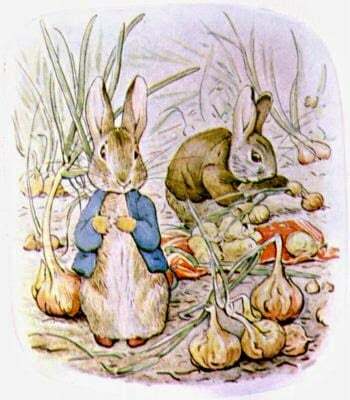 You may be forgiven for thinking of Beatrix Potter as the talented author and illustrator of a large number of children’s books, including The Tale of Peter Rabbit, but she is much more than that. For Beatrix Potter was a leading mycologist (someone who studies fungus) and conservationist and it was these interests that lead her to write her best-selling books. Beatrix Potter continues to enlighten people today as a recently discovered parasitic fungus (Tremella simplex) in Aberdeen was found to have been drawn by Beatrix Potter in the late 1890’s. So what drew the young Beatrix to nature and its study? Beatrix was interested in nature from a very young age and was very meticulous in recording observable data, often drawing or painting what she observed in nature. Although these paintings were not systematic as Beatrix drew what interested her it led to her close friend John Everett Millais acknowledging her keen eye: “plenty of people can draw, but you…have observation.” From as young as nine years of age Beatrix was drawing watercolours of caterpillars with anatomical and field observations. Her love of nature was further enhanced by opportunities during her childhood. Beatrix was born into a wealthy family and so enjoyed summer holidays near the River Tay in Scotland which enabled her to draw a wide range or flora and fauna in the local area. 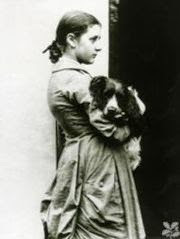 Additionally, she was able to learn photographic techniques, including detail and perspective, from her father Rupert, an amateur photographer, further enhancing Beatrix’s talent in painting. Subsequent trips to the Lake District also influenced a lot of Beatrix’s painting at a young age. On these trips she also exhibited a keen interest in geography and archaeology, noting in her journals about the formation of land, soil erosion and paintings of fossils. Educated privately through governesses at home, Beatrix’s talent in drawing was recognised early and further tuition in painting was provided. However, this was detested by Beatrix who did not wish to copy other painters but experiment with her own style, later sticking with watercolours. Beatrix cared for a lot of pets at home and these provided a great source of inspiration for many of her drawings. She would also draw a menagerie of animals secretly hidden in the nursery with her younger brother Walter Bertram including mice, rabbits, bats, snails, egg collections and insects. Additionally, when pets died the Potter children would boil the corpse and play with the bones to learn more about the anatomy of the animals they drew. At first, study for her drawings were through the use of a hand lens, then a camera and later with her younger brother’s microscope and this is how Beatrix became fascinated with fungi. 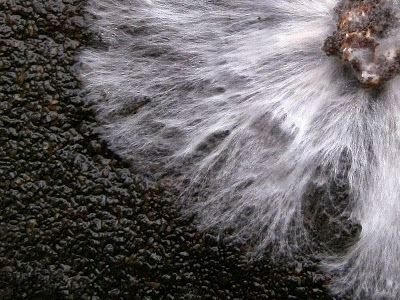 Her interests began at first with their colour and structure and she later became interested in her 30’s in the role of spores in reproduction of different fungi. At the time this topic was highly debated within British mycologist circles. On a holiday to Scotland in 1892, Beatrix formed an alliance with a noted naturalist Charles McIntosh and exchanged her accurate drawings of rare specimens for his knowledge of microscopic drawing of fungi, knowledge of taxonomy and live specimens during winter. By 1895, Beatrix had collected and drawn the spores and spore-producing structures (basidia) of the mushroom Boletus granulatus, now called Suillus granulatus. She had also successfully managed to germinate spores of a number of species and produced drawings of the mycelium. With these interesting results at the time, Beatrix approached the Royal Botanic Gardens at Kew Gardens only to be dismissed by the current director, Willian Thiselton-Dyer. However, her uncle, the chemist Henry Enfield Roscoe, encouraged Beatrix to continue her research into fungal spore reproduction, which she then later offered to the Linnean Society in London, though at the time they did not admit women or allow them to attend meetings. The paper Beatrix submitted was titled ‘On the germination of the spores of Agaricineae’ and contained many of her microscope drawings. This paper has since been lost but it seemed as if Beatrix was heavily interested in the idea of hybridisation. Around this time as well, the principal of London’s Morley Memorial College for Men and Women, Caroline Martineau, commissioned Beatrix to produce lithographs for use in lectures, of which two survive today, one on a Sheetweb spider and the other of insects. After a lifetime of drawing Beatrix donated her botanical and mycological drawings to the Armitt Museum and Library in Ambleside, Lake District. These are still used today by both amateur and professional mycologists and 59 of her drawings were reproduced in a book on fungi. However, these feats are not the limits to Beatrix’s love of nature. During her life, Beatrix also became fascinated with the countryside, not in keeping with her parents’ views for their child, and became a wealthy land owner in the North of England, running both her own farms and those she shared with the National Trust. It is through this work that Beatrix became interested in conservation, particularly concerned with breeding native Herdwick sheep and promoting the preservation of the land in the Lake District. On her death, Beatrix Potter donated her land to the National Trust and today over 1700 hectares are still enjoyed by thousands of visitors each year. 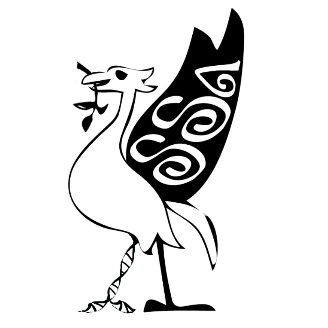 This post, by author Rebecca Jones, was kindly donated by the Scouse Science Alliance and the original text can be found here. Having studied Psychology in various forms for many years, I have often questioned the merit of some theories. It seemed to me that the psychological mechanisms that we investigate are often far removed from natural behaviour, and I shared the view of many that my field has a tendency to be reductionist – simplifying complex feelings and behaviours to little more than cogs in a machine. In fact, in my cynicism I have at times wondered whether some reported parts of behaviour actually exist. One example, taken from research on the topic of memory, is a process referred to as ‘reconsolidation’. According to reconsolidation theory even a firm, long-term memory can be tampered with, possibly changing the memory altogether. Reconsolidation centres upon the process of ‘consolidation’ where a memory trace is converted from short- to long-term memory. For reconsolidation to occur an existing memory must first be reactivated by a similar experience. It is this reactivation which renders the memory unstable. The unstable memory can then be modified by new experiences/information and undergoes a second consolidation, or ‘reconsolidation’. It is during this stage that alterations to the original memory can be made. The extent to which the reconsolidated memory persists depends upon the properties of the similar experience, but research suggests that the changes can be permanent in some circumstances. My initial scepticism regarding this process was two-fold. Firstly, I found it hard to believe that an established long-term memory could be affected by showing me another similar piece of information. Could the memory of my parent’s address be altered like this? Surely this was absurd? Secondly, it seemed to me that reconsolidation theory may have been a scientific explanation of confusion brought about by knowledge of two similar and conflicting pieces of information – something I’m sure we have all experienced before. Until recently, I hadn’t experienced anything in my own life that I could attribute to the process of reconsolidation, but I’m pleased to report that recently my stand-point on this has changed somewhat. Whilst living in Germany and attempting to learn the language, my German friends would often ask me to tell them an English word for something. My prior conclusions would have led me to believe that I could not possibly forget an English word that I have known all my life, simply by holding the equivalent German word in my head at the same time. However, one day whilst in the supermarket my German friend pointed to ‘Weisse Spargel’, which I knew in German and English. When he asked me for the English word, all I could do was stare blankly and mutter ‘Weisse Spargel’. It took me several hours of frustrated thinking before I eventually shouted out ‘ASPARAGUS’ later that evening! 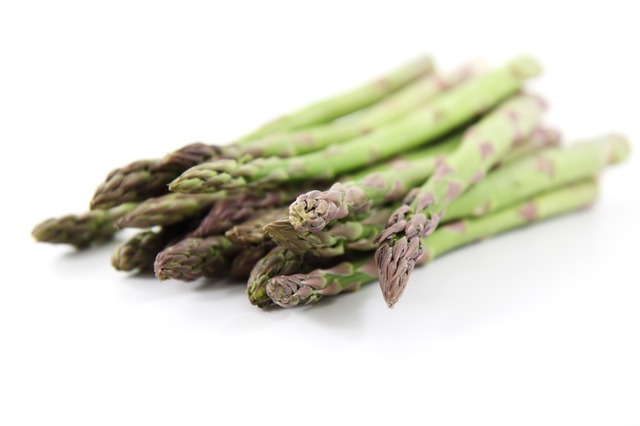 In conclusion, I believe it is probable that repeatedly seeing the Weisse Spargel in the context of a German supermarket, over many visits reactivated my memory of the word asparagus. This reactivation rendered my initial knowledge temporarily unstable, and upon reconsolidation my knowledge was re-weighted to the German, rather than the English word. I can discount the possibility of being confused in this case because my knowledge of the word asparagus was not something I could mix up with something else. The information was there, but something very real had changed that made it more difficult to access. I’m pleased to report that, although this was not an isolated incident, there were no lasting side effects, and I have not (yet) permanently lost my ability to speak English. To find out more, please see this review by Thomas Agren. It’s ironic that the Brasil 2014 World Cup was one of the “cleanest” World Cups for some time. Ironic, because this was the World Cup where the Uruguayan striker Luis Suarez had another bout of teething trouble and chowed-down on an Italian shoulder. This hunger aberration aside, the players generally behaved themselves or at least when they did trespass perhaps the officials were prepared to be lenient if indeed they witnessed any wrong-doing at all. This all brings me to an important consideration that I’m sure has divided many offices – The World Cup Sweepstake. A national tradition. An unmissable ingredient to raise the pulse. The best way to waste a pound. The competition winner was fairly obvious. As was the runner-up. But then we get into some uncertain waters. The alternative prize at stake in my competition was the dirtiest team. So how to work this one out? Just give it to Uruguay? Or the team with the most red cards? Or the team with the most straight red cards perhaps? 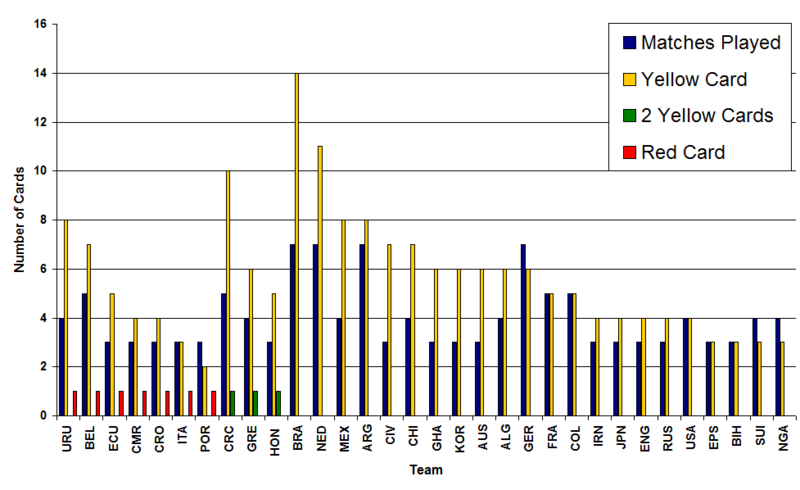 Below is a plot of the yellow and red card statistics for each team, with the number of matches played in the competition in blue. When a player is given two yellow cards in the same game (resulting in a sending-off), this is shown separately to those yellow cards that do not contribute to a sending-off, green and red bars respectively. We can see that Brasil not only wore yellow but weren’t shy of picking up a few bookings here and there too. The Netherlands and Costa Rica also said hello to yellow more than the rest. The teams to the left up to Honduras all had a man sent for an early bath at some stage too. So, is Brasil the dirtiest team? What we need is a combined yellow and red card statistic.The plot below shows some candidates. Let‘s assume that a yellow card is worth 1 point and a straight red card is worth 3 point so for example a team with one yellow and one straight red would score 4 points. The question then is how much should a two-yellow-card-red-card (TYCRC) be worth? The dark blue bars show the values if two yellows is simply worth the sum of two normal yellows i.e. two. The red bars are if its slightly worse but still not as bad as a straight red (2.5 points) and the green bars are if a TYCRC is worth the same as a straight red card (3 points). 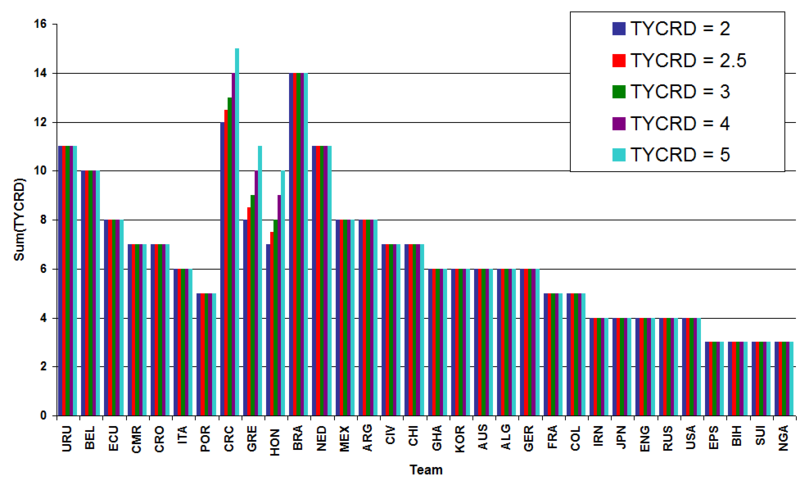 Purple is slightly worse still (4 points) and finally the light blue bars are if the TYCRC is worth the individuals yellows and the red card values (5 points). We see that in general Brasil are still naughty step contenders. Only when TYCRC is worth 5 do Costa Rica edge ahead. But this still isn’t the whole picture. Obviously if a team played more games then they are more likely to have picked up a booking or two along the way so we should account for this. 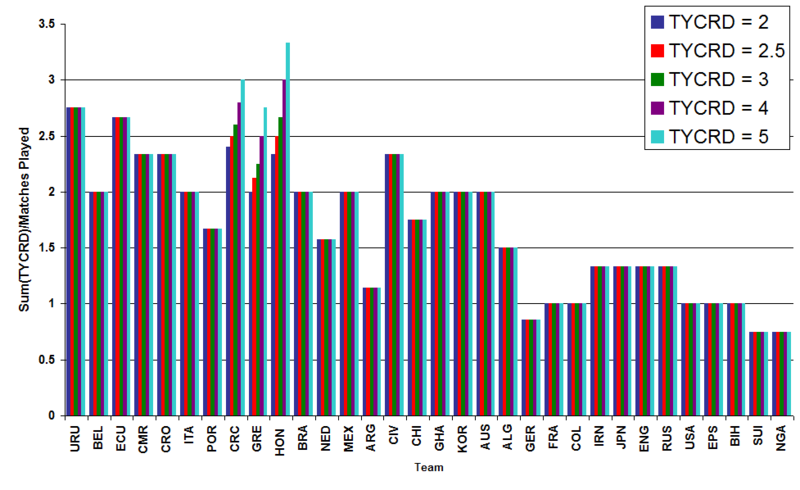 When we divide the numbers in the plot above by the number of games that each team played we get the plot below. Now we get that when the TYCRD is worth two single yellows or just a bit more then Uruguay are on top. For any values bigger then Honduras come steaming-up on the inside to take pole position. So, what does this all mean? Well, personally, I would say that Brasil actually aren’t all that bad after all and that Uruguay are in fact the dirtiest team of the Brasil 2014 World Cup even without taking in to account the on-going antics of Luis the Chewey.